The second most popular question I receive is typically related to some form of hair-care. How long have I been blonde? What products do I use? Where do I go? How do I maintain? I've been highlighting my hair for so long now I don't even know if I could tell you what my natural colour looks like anymore (sad but true). With over a decade of bleaching, highlighting and toning under my belt, I thought it was time to share of my favourite hair care products with you. Moroccanoil Luminous Hair Spray: Smells great and holds my hair well without the stiff, textured look. Kerastase Paris Bain Force Architecte: After years of treating my hair to drug-store shampoos, I was advised it was no longer cutting it for my hair. The immediate sticker shock was certainly unexpected but the investment was worth every penny. My hair actually feels healthy (which is rare for a lot of blondes) after a wash with this stuff! Kerastase Ciment Anti-Usure: If it's one of those weeks where a hair-mask or coconut oil treatment session isn't likely to happen, I'll leave a dollop of this in my hair at the end of a shower and let it soak for 3-5 minutes. A simple rinse out and you're good to go! Virgin Coconut Oil: Since the Kerastase line is so pricey, I'll swap hair mask treatments out for coconut oil to get more mileage out of the products. I find coconut oil will leave my roots oily so I tend to focus more on my ends during a treatment. 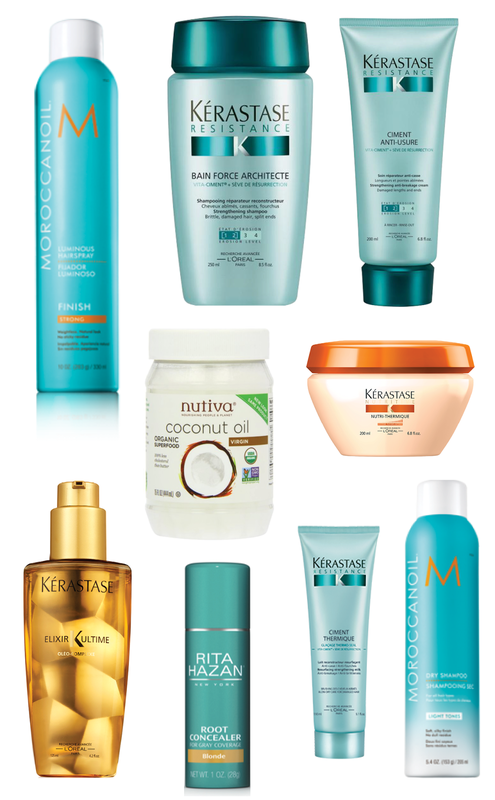 Kerastase Elixir Ultime: THE oil of oils. One pump of this into damp ends after a highlight appointment at the salon and your hair feels nourished and almost like it's been trimmed. Unfortunately, this won't get you out of a 6 month trim but it helps! Rita Hazan Root Concealer: I used to be guilty of hitting up the salon every 4 weeks for highlights. I've learned with time that by embracing roots it not only allows longer periods in between salon visits (who doesn't love saving money??) but also makes it easier for your colourist to avoid overlapping colour at the next appointment. If I'm really itchy to hide my roots for a special event, I'll use this Root Concealer to get me in between appointments. Kerastase Ciment Thermique: A lightweight cream that I'll apply if I plan on blow-drying my hair. I try to let my hair air-dry when possible when that's not an option, this is my go-to for heat protection. Moroccanoil Dry Shampoo for Lighter Tones: I recently switched to this Dry Shampoo and am so pleased with it. Getting that extra day out of your blow dry means less maintenance and heat damage to your locks! *This is a not a sponsored post, just my own personal opinions. Moroccan Oil hairspray is THE best! Nothing better really, huh?! I'm a huge Kerastase fan too. Once you start you can never go back to anything else! And like you said it is worth ever penny.